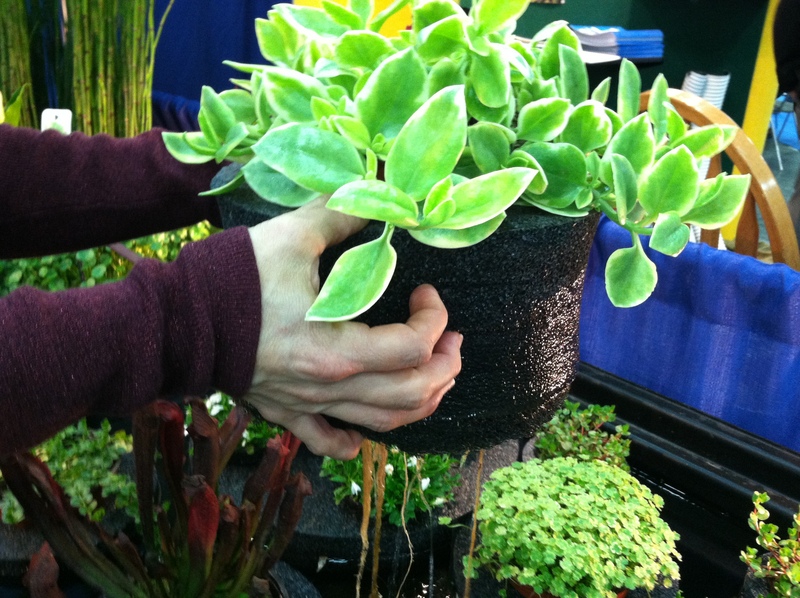 I checked out the Proven Winners’ introductions at Spring Meadow Nursery at the latest MANTS show, to see what is the latest and greatest in shrubbery! 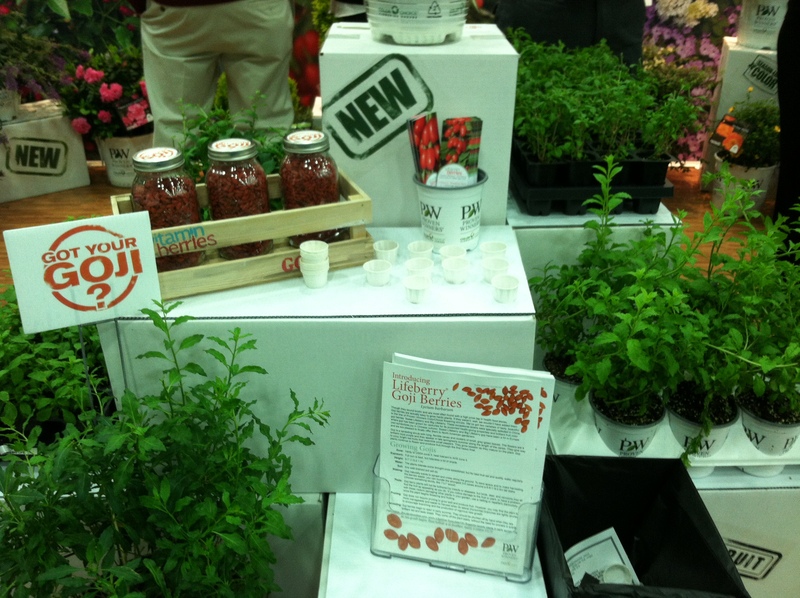 Goji Berries are the new berry bush that is being promoted as a healthy and tasty berry addition to the landscape. I know that I have increased my berry consumption in the past couple of years, and am always looking for new varieties and ways to include them in my landscape. I learned that Gojis, Lycium barbarum, are hardy, easy to grow shrubs that bear bright red berries that resemble little red hot peppers. You can eat them fresh or dried and they have become popular in Europe, and have been grown in Japan and China for years. Super Dose Of Vitamin C: It is estimated that a handful of goji berries have more vitamin C than a whole orange. So, these berries alone can provide all the vitamin C you need in a day. Vegan Amino Acids: It is usually very difficult for vegetarians to get proteins. But these healthy berries pack a punch of 18 different amino acids in them. So if you are a vegan, you must have these berries as a part of your diet. Anti ageing -Goji berries are a well kept Chinese secret to anti-ageing. High anti-oxidant content -Ancient Chinese beauty treatments makes use of these berries to make face pack due to their high anti-oxidant content. Omega-6-fatty acids are the new mantra for health and are abundant in Goji berries. Vitamin E: Have you ever heard of fruit that contains vitamin E? Vitamin E is usually present in nuts and oils. Goji berries are probably the only fruits on the planet to contain vitamin E.
Trace Minerals: Some very rare minerals are also present in these berries. Zinc and selenium are called trace minerals because only traces of these are found in different foods. Anti-Infection: Goji berries have both anti-bacterial and anti-fungal properties. So, they can give you protection against infections in general. More Carotene Than Carrots: Would you believe it, these berries have more beta-carotene than carrots! That makes these berries a must have for your eyes and skin. A lot of nutritional punch for such a small berry! Grow Goji berries in full sun but they will tolerate a little bit of shade, and are hardy to USDA zone 5 (We are 7a here in most of MD). The habit of the shrub is to sprawl along the ground so it is suggested that you bundle the largest 3 to 5 canes together around a sturdy 6 to 8 foot high stake. The berries begin to ripen in early summer and should be picked when bright red and sweet. The berries should be on the shrub for several weeks before they turn sweet. Taste test before you pick. 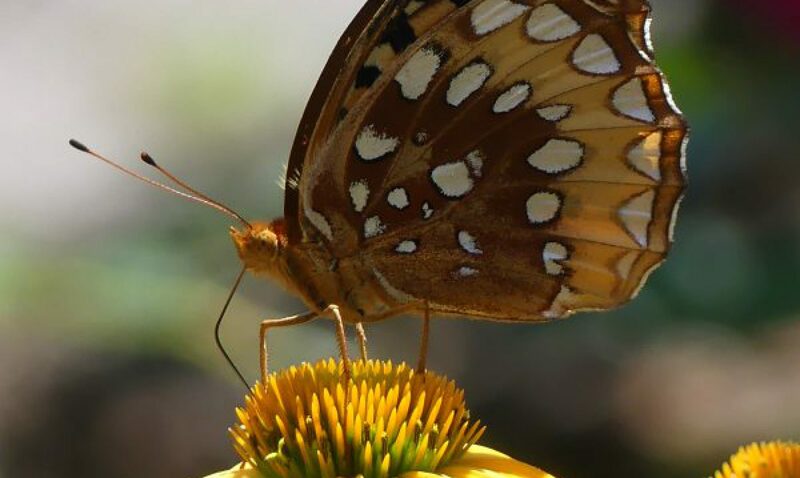 Unlike some berries, you don’t need more than one for pollination. I read that they do good in containers, but for such a large shrub you would need quite a large container. 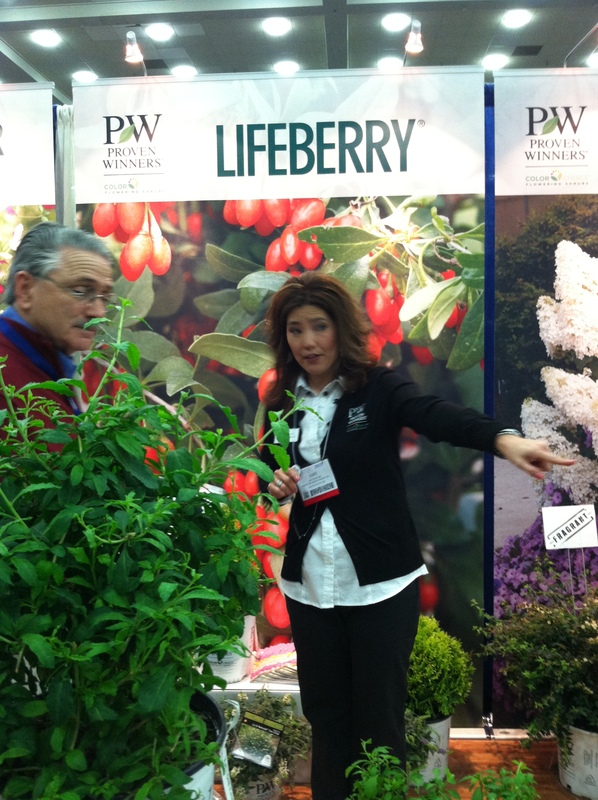 I got 2 Goji berry plants at the MANTS show and will be very interested in how they perform. If you have a pond and want to add some interesting plants to the mix, you can try these styrofoam floating planting rings. 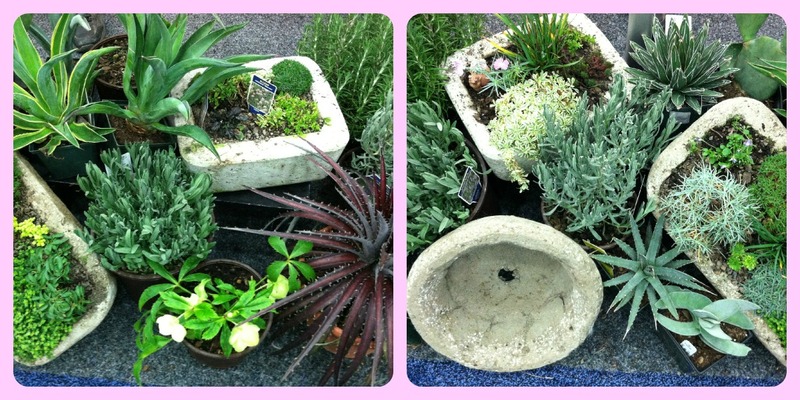 I visited MD Aquatic Nurseries and really liked these planting rings that can include one or several plants. You plant your aquatic plant in a plastic pot and stick it into the styrofoam holder that can hold just one or several plants and plop that into your pond to float. The roots extend out of the pot into the water. 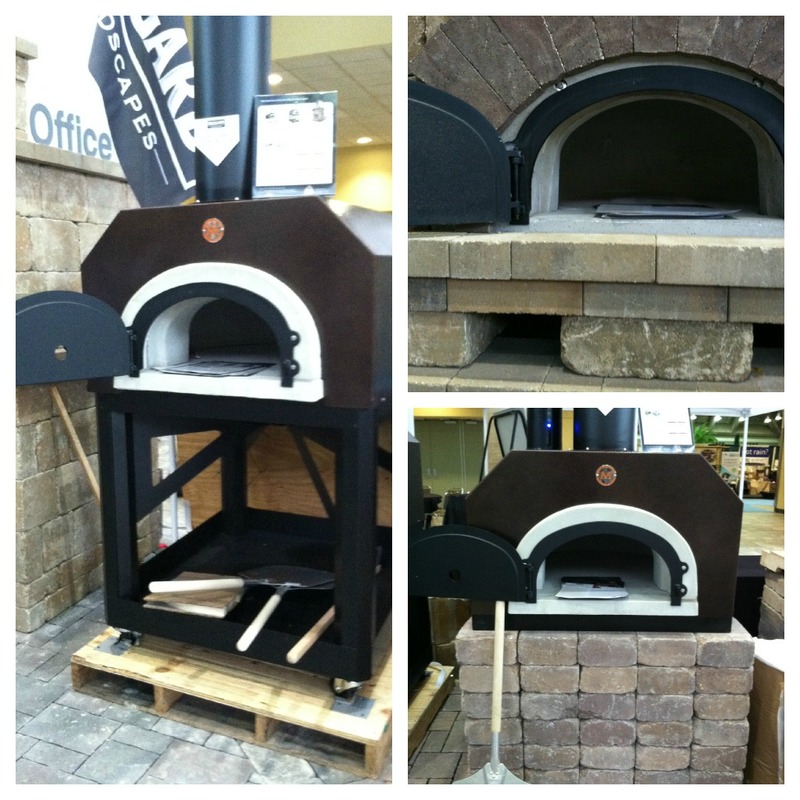 I have always wanted an outdoor pizza oven in my back yard, and when I visited Belgard Pavers I saw a way I could incorporate one into a wall that I am planning on building. You can buy the cement shell of the oven that has a vent, door, and hearth. The oven is then covered with stone to make it part of your hardscape. You build the fire inside of the oven and once it is very hot, you push the coals to the side, slide your pizza in and cook it in minutes to get that brick oven flavor. It makes for a great pizza party! I was very intrigued to see a plant that was incorporated into an arrangement, that I didn’t recognize and looked like cockscomb. It turned out to be Cryptomeria cristata and it is beautiful in flower arrangements and I am interested in growing it for that reason. Also known as the Japanese Crested Cedar, it grows to be a loosely limbed small tree known for it’s fasciated branches that looks like common cockscomb. I have put this on my list to look for in my travels. It isn’t new, but I have never seen it before. 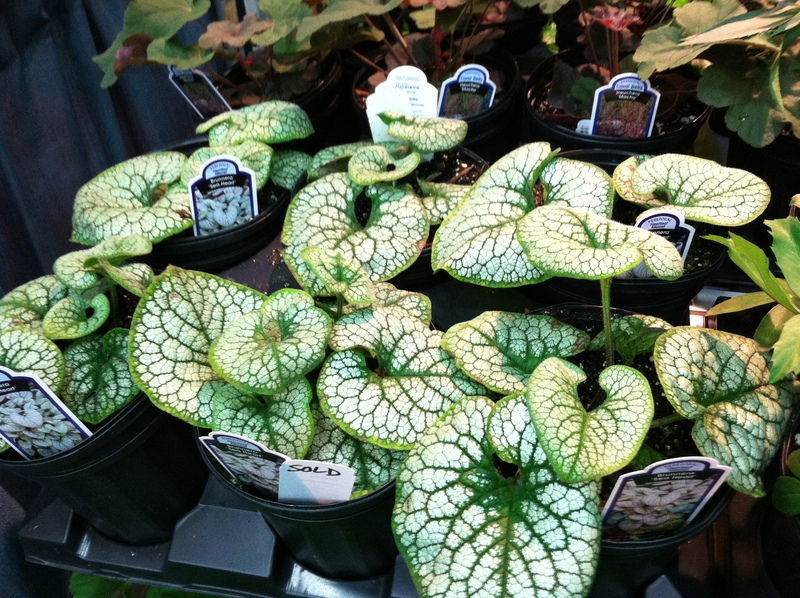 The variegated Brunneras, or Forget Me Nots, tend to melt in heat and humidity, and there are two new ones that are supposed to tolerate those conditions better. 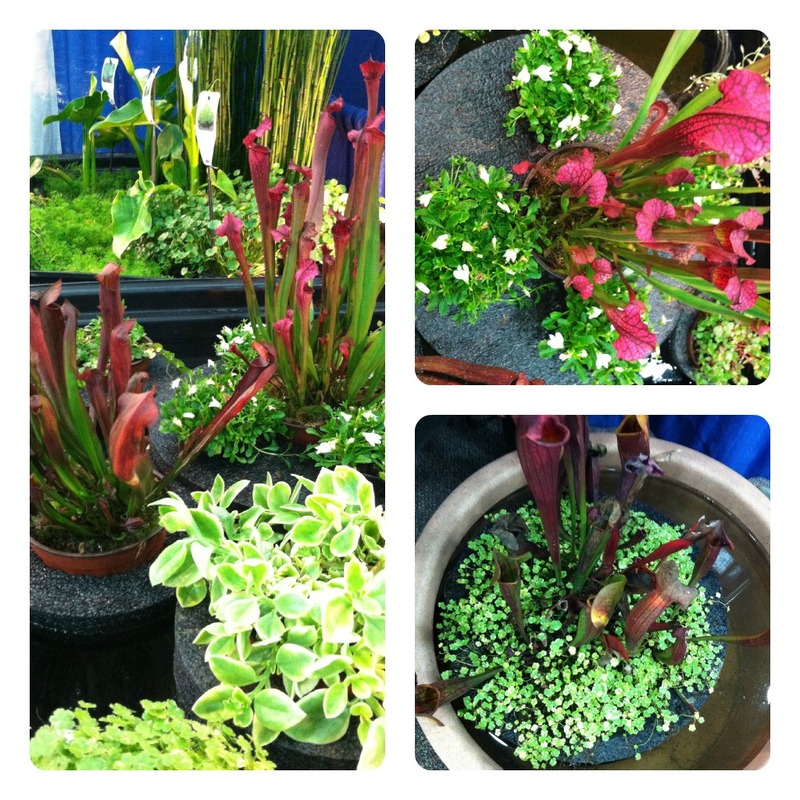 They are ‘Silver Heart’ and ‘Sea Heart’ and Babikow Nursery had beautiful ones on display. 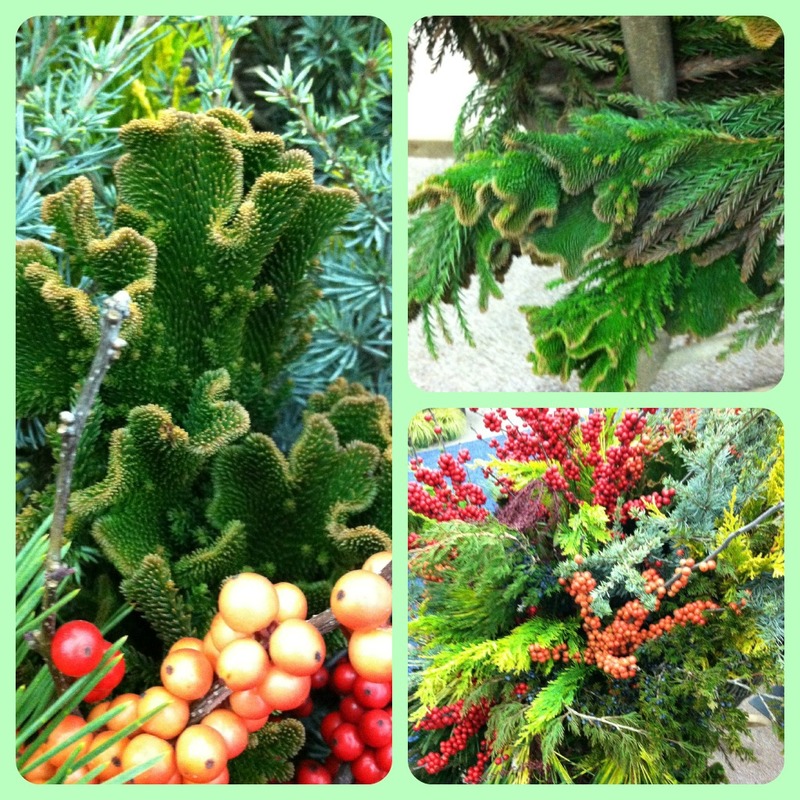 The leaves felt very leathery and tough and they looked so healthy, I am going to try a few this year. 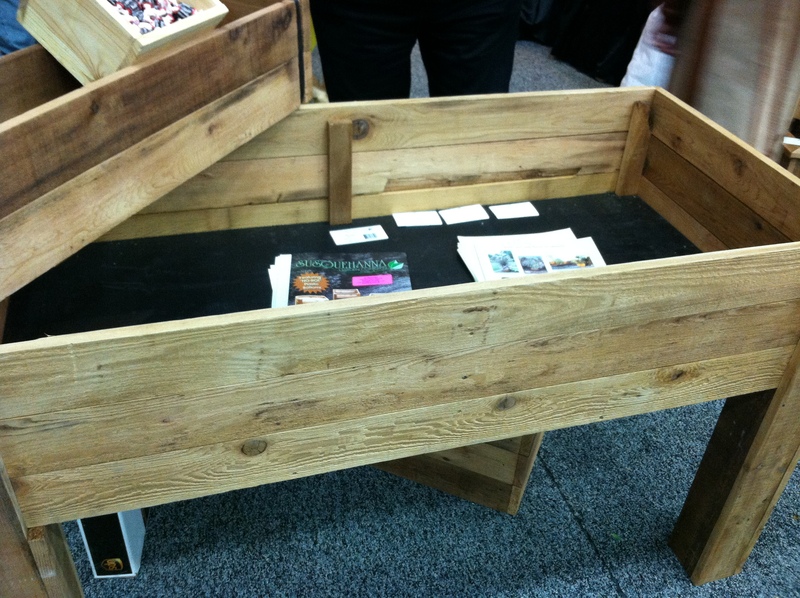 For handicapped or elderly gardeners, I thought this raised bed was the perfect solution to grow veggies and flowers in. The only improvement that I could see would be to add casters or wheels on it so you could roll it around on a hard surface like a deck or patio. It looks simple enough that a handyman could throw this together in an afternoon too. Troughs are pretty mainstream now and you can buy some very nice pre-made ones that are different sizes and shapes. I still like to make my own though. I thought these troughs were well made and I liked that they had a large drainage hole. 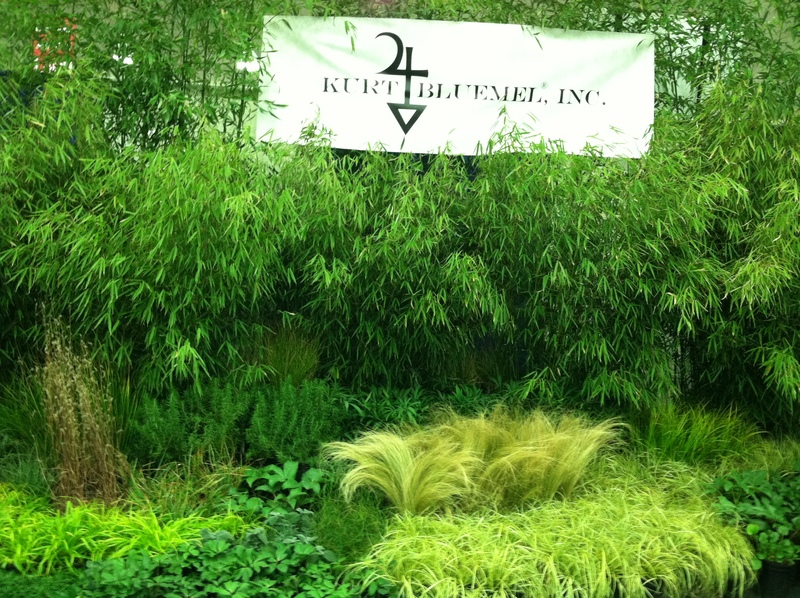 Kurt Bluemel’s Booth- I love the textures and colors of the grasses and bamboos! At the end of the show, most vendors want to sell the contents of their booth because they don’t want to take it home. Many are sold as a unit, but others will sell their wares piecemeal very inexpensively, and that is what I was interested in doing – picking up flats or single plants. It is always a mad rush as the show is so spread out, and you can’t get to all the vendors in the last hour. So I made sure that I tagged a lot of plants ahead of time to pick up later. I had so much to pick up that I brought a wagon and a huge tote bag but still had to make several trips to the car. I picked up a flat of hardy Cyclamen and heaths and heathers, as well as some beautiful Hellebores, Orchids, and miniature conifers. It was a good haul! 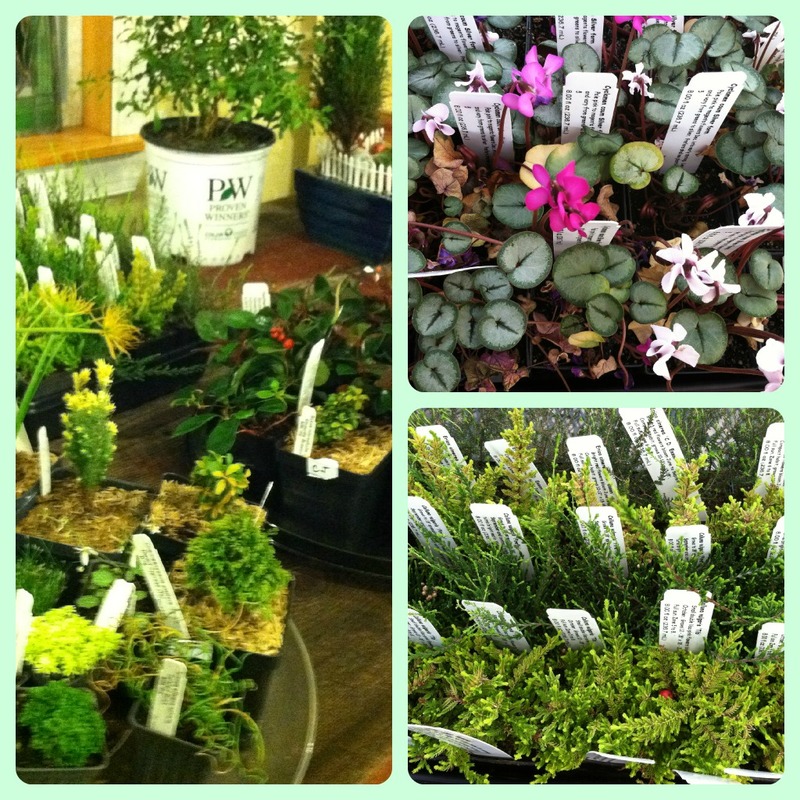 Heaths and heathers flat, hardy cyclamens, and assorted small conifers – I brought all these home for almost nothing! Next PostNext Not Another Echinacea!! !